INFLCR’s office space occupies the second floor of an 8,000-square foot building owned by and shared with the construction firm Creature. INFLCR’s 4,000-square foot second floor provides work space for INFLCR’s leaderships, sales, client services and development team that now exceeds more than a dozen employees, with plenty of room to grow. INFLCR has relocated from Innovation Depot in downtown Birmingham, Alabama, to a stand-alone building at 2212 First Ave. South in Birmingham that better serves a growing roster of employees and clients. “I am very thankful to [Creature co-founder and CEO] Mike Gibson, who offered up this building with an opportunity to buildout something to suit the INFLCR vision and preserve our culture in our own space” Cavale said. 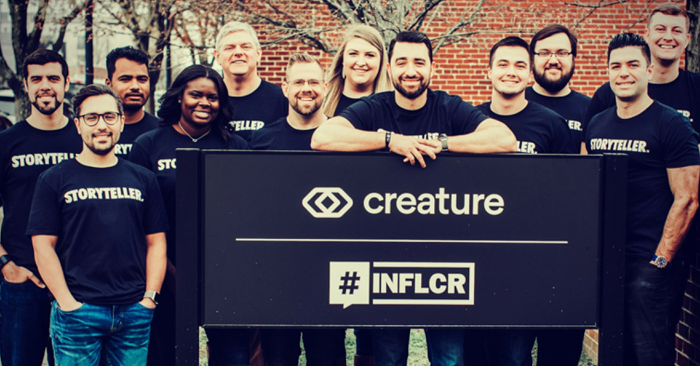 A big part of our story is Creature, which is a construction company, who had this beautiful building and opened up the second floor for us to move into after spending our first year in Innovation Depot. And so, Creature made it possible for us to move into this building in only our second year in business, but also to build it in a way that brought our culture to life. For a young company to have culture, that’s really important for us. Our culture really starts with our core values, and so we put them on our stairs so every day, when you come in here to work, you can remember what we’re about. These are all things that we do in our roles, whether it’s engineering the product, sales and marketing, and supporting our clients with Client Success, bringing them impact through our technology. This brand was founded to serve storytellers in the sports world, whether it’s the teams we serve at the big time college and pro levels, or the athlete users who get content from those teams using our platform and the INFLCR mobile app to tell their stories. 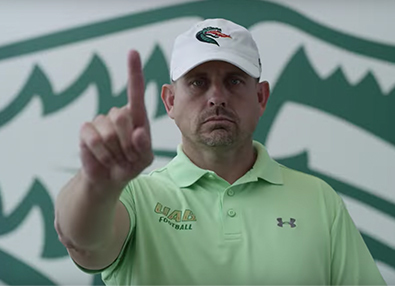 Finally, “WIN THE DAY.” That’s always how you end as you walk up the stairs, because every day there’s something that you can do to win in your role for the sake of the purpose of this company: serving storytellers. Our standup meeting space upstairs gives us the ability to video conference for some of our remote employees, with 15 employees based here at our Birmingham headquarters. We also have our Dream Wall, so that you can see for each team member what they want to accomplish in their life, and how this business can help them do that. Our office structure splits up into groups like Developers and our Marketing and Sales team right as you walk up the stairs. We try to celebrate our clients all the time, and that energy has gone into making a wall with logos from clients during our first year, and keep adding to that to remember all the clients we serve. We have phone booths for calls, either for support calls coming from Client Success, or maybe you’re on the sales team trying to introduce INFLCR to somebody. We have our own podcast studio, where we’ll be making a lot of new content this year – stay tuned! On the other side of the office is our Client Success team, overseeing athlete user engagement, client activation, and more. We also make sure to do is have collaboration rooms where you can be private. We have weekly team meetings in our main conference room, with focus of getting updates and hearing what’s going on with the product team, client success team, business development, etc. Finally, Jim’s office is also a meeting room that is used a lot for collaboration with the business development team. At the end of the day, for us to be building a culture this early in the business is really important to us. Having everybody together, working, and collaborating in a cross-departmental fashion is key. Without a team, you can’t build anything impactful or significant. When you’re here, make sure to ask about The Bell. Every time we’re able to find a new storytelling brand that we can help with our software, we ring The Bell. We’re very thankful for this office – we hope you can come by sometime and see it!